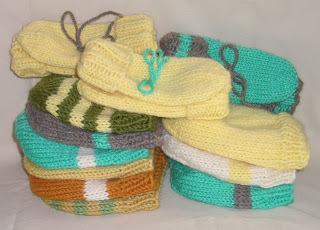 On the first day of May I set a goal to use my wool scraps to make hats for the babies at the Rankin Birthing Centre in Canada. This week, in addition to the hats I sent earlier, I mailed five wool hats to BJ and an acrylic hat with matching socks. This is an on-going project, so I pledge to make socks for my next donation. 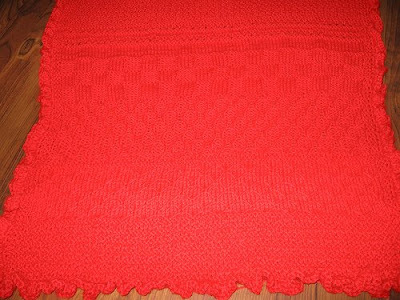 Red Roses is an Oddball Baby Blanket being knit by different knitters around the country from the same skein of yarn; thus, it is an oddball of an Oddball. Red Roses was started in Pennsylvania then ventured to California. It made its way back over the Rocky Mountains to Wyoming where I added my four inches using a checkerboard stitch. 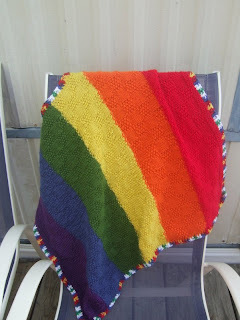 I will mail the blanket to New Mexico on Monday. I think that a basket full of yarn is pleasing to the eye: it gives a feeling of comfort and warmth. I have baskets stuffed with yarn everywhere in my house, so why not on my computer? So what is stopping you from giving your computer a warm, cozy feeling? While waiting for the Oddball blankets to arrive in the mail, I started one on my own needles. 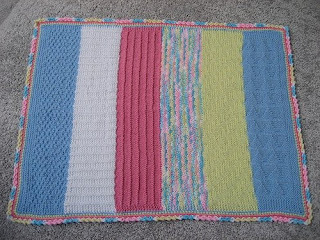 I named the blanket, Bubble Gum, and used a variety of colors and stitches. 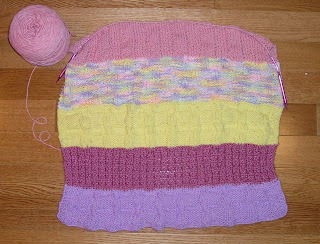 I began with the Box Stitch and progressed to a Ladder Rib and Garter Rib. 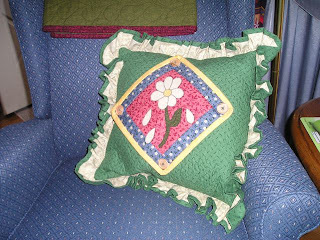 I also used the Woven Stitch, Garter Steps, and Triangle Ribs. 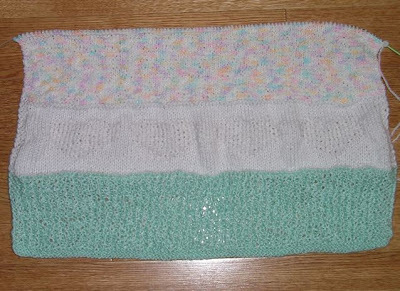 Jennifer, a member of KnittingHelp.com, added a crochet border to Bubble Gum. 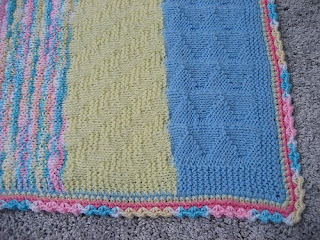 Thank you Jennifer, the blanket looks much better with the border. Without the base, Lander Lil is about 3 foot high. 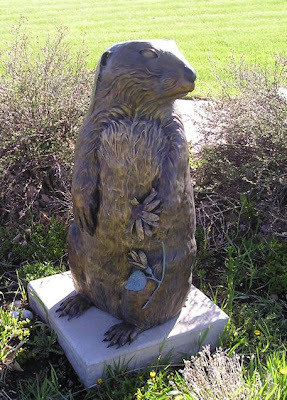 She is located in a green area near the Post Office and is surrounded by benches. Perhaps, the benches are for walkers who want to sit and rest awhile, or perhaps they are for Lil's fans who gather on February 2nd. Lil is a local celebrity because she forecasts the weather although some believe she is an impostor. Several years ago, Lil disappeared and a massive search took place. She was later found at the local dump, having been discarded by the thieves. She was scratched but suffered no permanent damage. 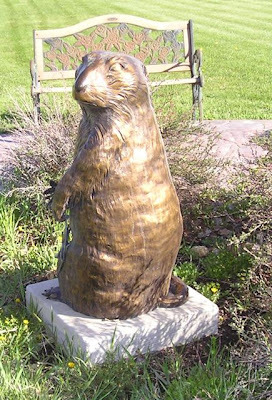 Lil is a prairie dog and has the ability to forecast the arrival of spring. She may not be as renown as Phil in Punxsutawney, but Lil makes the news, too. Okay, so it is only one line at the end of the article, but press is press. Right? Unlike Phil who is caged and pampered, Lil is content to stand alone on the hillside in Lander. She gazes intently at the mountains and watches the traffic (Is there really such a thing in Lander?). Lil welcomes the occasional visitor who ventures across the grass and sits to admire the mountains with her. 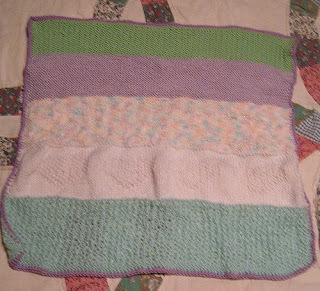 This Oddball Preemie Blanket did not contain much lavender or green when I received it, so I chose a variegated yarn that had small amounts of mint green (to match the initial yarn), pink, lavender, and yellow. I thought using a solid lavender would be too much of a contrast. I hope that future knitters will use some lavender yarn so the blanket lives up to its name. 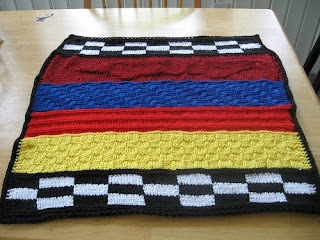 Another Oddball Baby blanket arrived in the mail this week - Speed Racer. I am really out of the loop because I had no idea that Speed Racer was a cartoon or that it was a newly released, summer, feature film. It was a grim reminder that I am getting old and that I am hopelessly out of touch. The blanket came on a bamboo, circular needle, which was a new knitting experience for me. I always use metal needles because they are faster, but I was pleasantly surprised at the speed of the bamboo. I also liked their warmth and the soothing clack of the needles as I worked. I may have to purchase some bamboo needles in the future. Speed Racer is finished and ready to find a home. 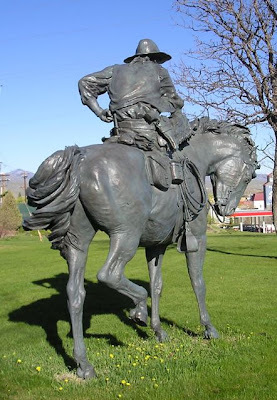 Eagle Bronze foundry is located in Lander, and it produces some wonderful works. I wish that more of their finished products were displayed in the area. 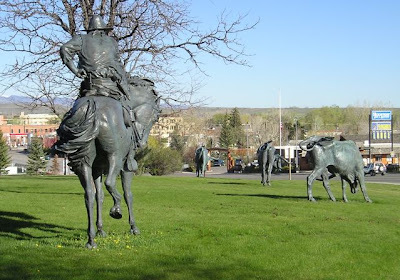 The Lander community commissioned a display, called Bronze Roundup, and currently it consists of four pieces: three steers and a cowboy astride a horse. This "roundup" is displayed at the south entry to Lander. 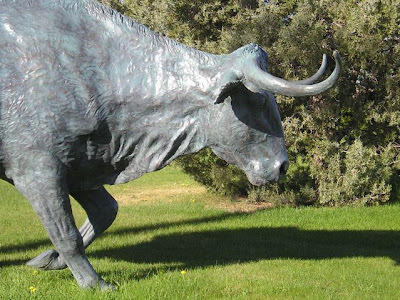 All of the bronzes are full-size and are scattered down a hillside. In my opinion, the cowboy appears to be bored or in a contemplative state as the steers ramble down the hillside. I have never seen cowboys at a roundup act as nonchalant as he appears. The steers at a roundup have an agenda of their own that does not match that of the cowboy. Even the horse seems impatient with its rider and is stamping its leg as if to say, "Let's Go." The longhorn steers seem to be headed for greener pastures. The head steer has its head up and is focused on the trail ahead; the others have their heads down looking for a tender blade of grass. 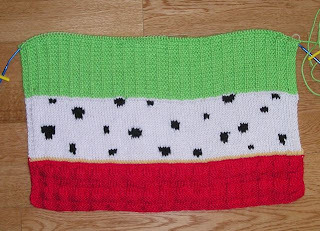 Another Oddball Baby Blanket (Rainbow Blocks) arrived in my mailbox this week. 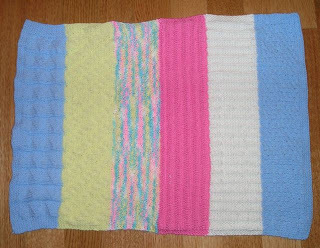 The blanket's strips will be knit using Seed Blocks, a pattern designed by the project coordinator. The strips will be red, orange, yellow, blue, green, and purple. 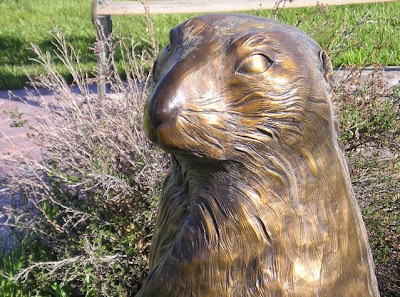 A local community college has numerous pieces of art on campus - some created by professionals and some by students. Sacajawea is the famed Indian guide that accompanied Lewis and Clark when they explored the West. 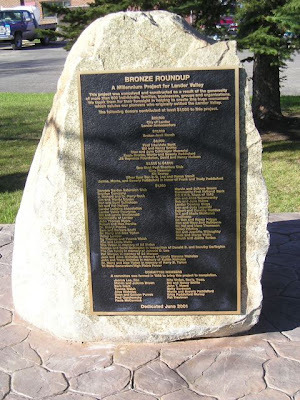 Sacajawea died on the Wind River Indian Reservation which is also located in my area. 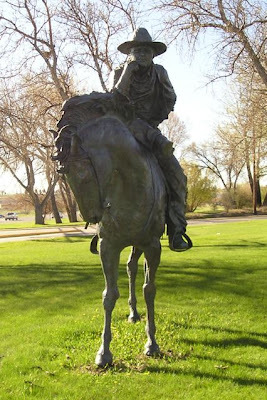 Her grave is located near Fort Washakie, but many communities around the United States claim to also be her last resting place. Personally, I believe she returned to her family when the expedition was over and died in the Wind River Range. Note the bundle on her back which is a child on a cradle board. Sacajawea was also featured on the Sacajawea dollar that was first minted in 2000. 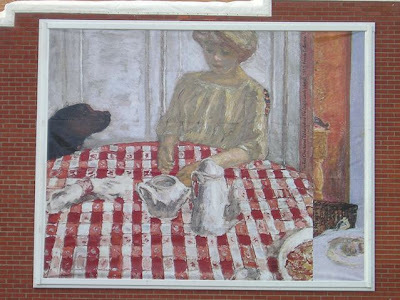 Several years ago, this painting seemed to have appeared overnight on the west side of the Peck Theater. I first noticed it on a dreary day and was immediately drawn to it. I am still amazed at the impact that it creates every time I see it. The couple intrigues me, and some day, I want to sit in the parking lot and write a story about them. The works of art that are scattered around the campus are as diverse as the people who attend the college. The college president stated at the recent graduation that 73 percent of the 2008 graduates were from Wyoming, 25 percent were from out of state, and 2 percent were international students. Art is plentiful in the communities in my area, but many times I do not notice it. Many times, I wonder how long an item has been hidden in plain sight. On a recent trip to rehab, I took my camera to capture some al fresco art in the surrounding area. 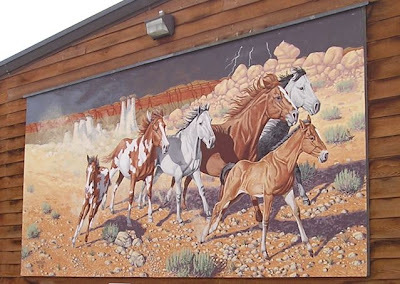 This mural is on the side of a popular steak house in Hudson. It has always caught my eye, but when I actually stopped to get the photo I saw more interesting details. The mural is not massive, but it is quite large. 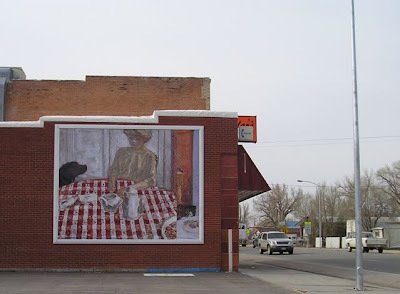 I have always loved this mural by a local artist, Jerry Antolik, because its tone changes with the weather. 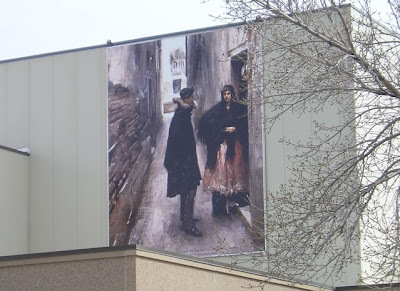 It is appropriately called "Running from the Storm" and is mounted on the side of the Hudson Town Hall and is 8' x 16'. 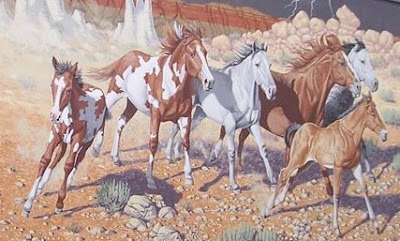 Change the perspective, and the horses seem to change the direction they are running. Smaller wildlife murals, also by Antolik, can be found across the street. 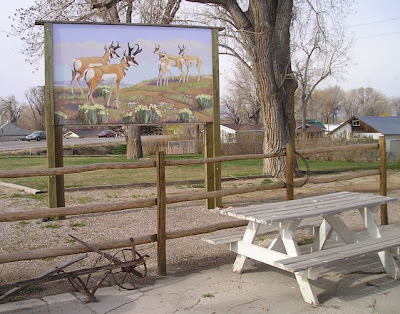 Enjoy this mural of Pronghorn Antelope while eating your lunch at the nearby table. 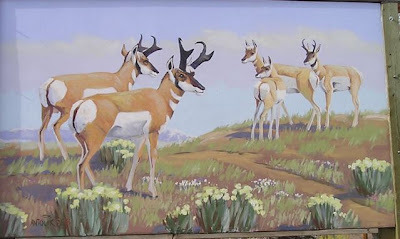 Antelope are common in Wyoming. 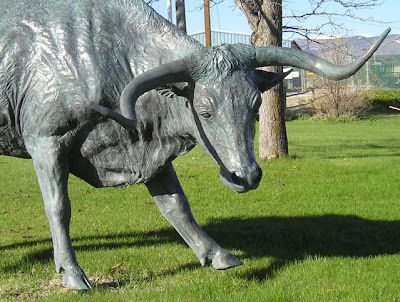 In Casper, they can be found grazing on the lawn at the community events center. 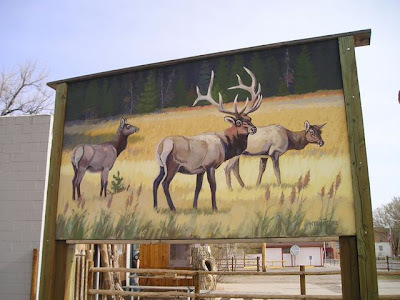 On the other side of the antelope sign, is an image of the wapiti or elk. This animal is common in the mountains, although some rarely roam into the plains. My pastor is in the Naval Reserve and recently returned from a nine-month deployment with a Marine unit in northern Afghanistan. He's been home since the end of March, but the church elders gave him a month to reconnect with his family before he returned to the pulpit. Two weeks ago, he shared his experience with the crowd that gathered at a carry-in dinner to officially welcome him home. Pastor M's presentation was accompanied with photos of Afghanistan. It was his photos of the children that tugged at my heart - children whose surroundings are harsh and whose lives have been touched in numerous ways through the kindness of strangers. He had photos of mothers and their children receiving hand-knit socks, hats, sweaters as well as soccer balls, food, and blankets. The children's smiles in those photographs were priceless. 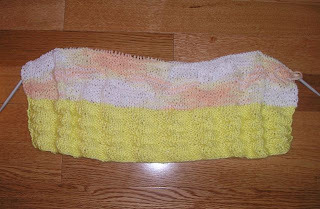 Those photos inspired me to get busy and knit more items for the afghans for Afghans (a4A) project. 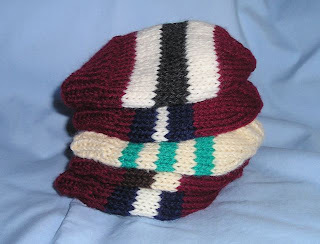 The deadline for this campaign is May 19th, not a lot of time to make more than a few hats, but knit I did. 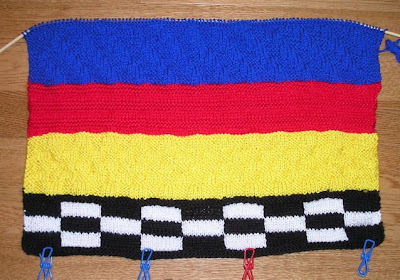 I had knit for a4A before, but now I had a direct connection to Afghanistan, a connection created though digital images on a projector screen and through the words of a man that I know and trust. Through his photos, I saw the harsh conditions the Afghan people face every day, I saw the beauty of their country, and I saw the gratitude for the hand-knit items as they are given to the mothers and children. Seeing Pastor M's photos and hearing his experiences has rekindled my desire to make an impact on my world. A single hat or pair of socks can make a big difference in the life of another. Will you join me in knitting for the next a4A campaign? 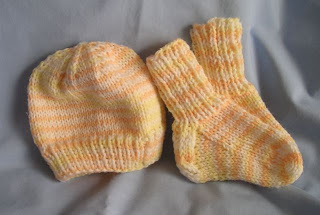 While waiting for "Firetruck Lane" to arrive, I used some small scraps of wool to knit baby hats and mitts for the All Crafts 4 Charity's May project. 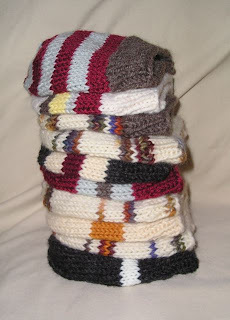 From the meager pile of scrap balls, I made nine hats and three pairs of mitts. These will be sent to the project coordinator (BJ) in Idaho. BJ will forward the donations to the Rankin Inlet Birthing Centre in Canada. Rankin Inlet is located on the western shores of Hudson Bay, and with a population of 30,780, it is the second largest city in Nunavut. Almost 85% are native peoples, mostly Inuit. BJ says, "The climate in the Rankin Inlet area is typical for arctic tundra. The ground is permanently frozen ( permafrost ), and the average annual temp is -18 F. Summer which usually lasts 6-10 wks has average temps of 37-60 F. The sun doesn't set for 6 months, and the other 6 months the sun doesn't rise. The birthing centre was established in response to Inuit women who wanted to deliver closer to home. No highways connect Rankin Inlet with Sountern Canada, which is where the closest hospitals are. Most transportation to and from Rankin Inlet is done by air. Snowmobiles and atv's are used between villages. Nurse midwives provide prenatal care and attend deliveries. All deliveries are unmedicated." BJ hopes to provide the midwives with baby clothing, bedding, and other little extras. Okay, I admit that the Oddball Knitting Rush turned into a crawl, but I didn't receive the package when I anticipated. It was probably for the best because things have been a bit hectic. Firetruck Lane arrived in Wednesday's mail. 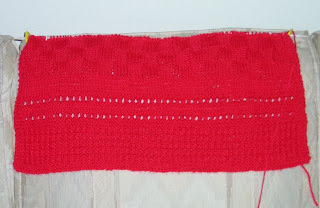 Since I had seen a photo of the blanket, I knew that red (the traditional color for fire trucks) had been used to start the blanket, so I decided to use Caron' Simply Soft in Limelight. My area has only one emergency vehicle painted this color, but I am sure other departments have a multitude painted lime green. Mama Dawn began the blanket by using Harris Tweed Rib that resembles the brick of the fire house, and Holly P added the Dalmatian spots to her section. I used a stitch that is similar to the ladders on the trucks. Now that this flurry of Oddball knitting is over, I can work on my other projects. April showers are supposed to bring May flowers, but it is too cold for any flowers to be blooming here. The gusting wind feels like it is blowing off of a snow-topped mountain. Hmmm, I guess it is. Even though signs of spring are all around (the trees are budding, the grass is starting to green, the tulips are up but are far from blooming, the robins are building their nests), it is just too darn cold to enjoy the season. Yet. 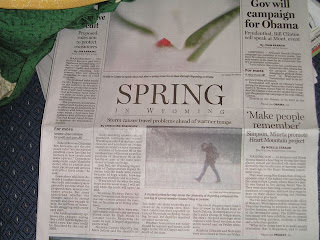 Today's paper featured a snow-covered tulip and a snowy and blustery day, some 120 miles to the east. Brrrr! It is just too cold to be spring. Yet. Maybe the next few days will bring a warm front and some warmer days, but until then, the only May flowers that I am going to be seeing is the one on my pillow. Tonight, I finished the sections on "Easter Basket" and "Just Ducky." Knitting on Easter Basket was wonderful because I got to see just how attractive the blankets are with all the sections complete. 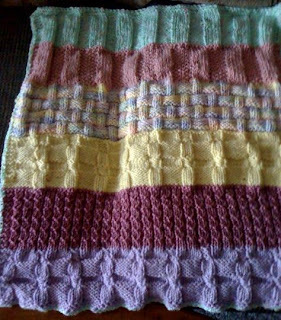 On this particular blanket, all of the knitters used a stitch pattern that resembled a basket weave. 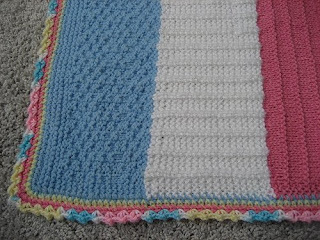 The stitches added a lot of texture to the blanket. Easter Basket is finished and ready to be sent to the hospital. I am curious to see how Just Ducky will progress. 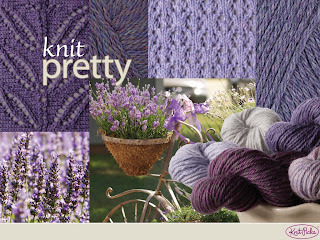 I cannot visualize what other colors the knitters will use. I had planned to use a solid yellow, but it didn't look right with the first section. 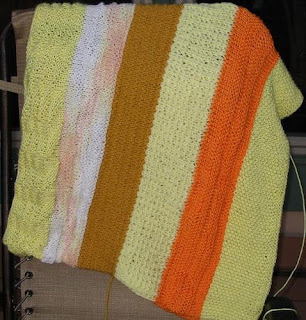 Thus, I chose a subtle variegated yarn with white, a light yellow, and a pale orange. Just Ducky has grown quite a bit and ready for some edging/border. 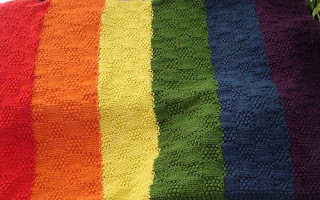 I am always amazed when I see the finished blankets and how good they look even with all the oddball colors from the different knitters. I should be receiving "Firetruck Lane" in the mail tomorrow. 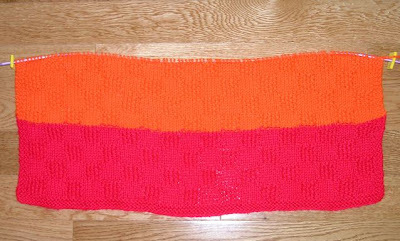 I think I am going to use a lime green yarn instead of the traditional red or white that is associated with fire trucks.